The link to the full spoiler is at http://magic.wizards.com/en/articles/archive/card-image-gallery/eldritch-moon-2016-06-28. If your deck is more burn, but you want a creature finisher, this can certainly fill the bill, because you definitely don’t want to pay full price for this. A personal Ancestral Recall (if you have an empty or insufficient hand) is usually nice. 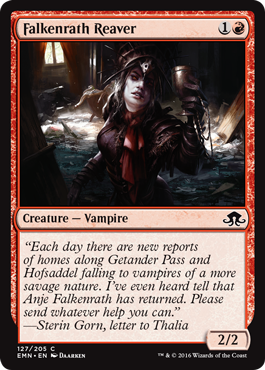 Apparently creatures Red normally wouldn’t get in other sets can be in Innistrad if they are vampires…a tribe not normally in Red. A 1/2 for R is never a bad idea in a color that’s usually all about offense. If this not common I may not have thought so highly of it, as that pump ability is expensive. Looks like we need to build our Dogs of War deck. A 2/3 for 3 is an average creature, but for red it’s normally a 4/3, and with some wolf synergy it could be quite nice. It’s amazing how excited we can be that Red finally gets a “grizzly bear”. The fact that Mark Rosewater gave a “grumbling” response about it on social media is indicative that he may need to go into a Stan Lee ambassadorial, which opens up a spot for a new Head Designer. These cards have never been that strong, especially due to the 4 card max. rule. This card is cheaper than those, but only hits creatures. Sigh. Here kitty kitty OUCH…HEY. Watch that tail. We’ve started doing reviews of the Reserved List, and what could be done to “reprint” these cards while not violating the sacredness of the List. Urza’s Destiny‘s turn in the spotlight is still weeks away, but it is nice for WotC to do me a solid and make my analysis of Donate easier. The original card was rated 4.567 (as of 7/9/2016), but is there the cards available you’d want to donate away to make this card worthwhile? That remains to be seen. The latest new take on Ball Lightning, this one with a Provoke power. It’s nice to get rid on one of your opponent’s critters for sure, but that extra mana can make a lot of difference. If I think of it as a cheaper Carbonize I can like this card better than I otherwise would for a 1R sorcery for 3 damage. I’d still rather have Incinerate back. I do have a fondness for Red Mythics that will not be seen as tourney-worthy, and thus easily in range of my pocketbook. It wouldn’t have been too far from an intro-pack foil, save that its mirror ability is probably too confusing for newbies. Think of this as a 3/2 creature for R you have to play around to use and it becomes much better, althro our love would go away if it was not a common. I do like red rush strategies in Booster Draft so I will like drafting this Hill Giant, althro I seriously doubt it is tourney-worthy. Being able to delay an opponent by a turn can mean quite a bit. This is a card I would have liked in my old multi-player decks (I always went more for mass damage than actually trying to win), but otherwise not one I’d normally play. Too bad it’s not a vampire, so that it could further improve tribal power. A Red Giant Spider for a mana less? Nothing to get excited about, but defense from fliers in Limited is always appreciated. I tend to run less land than most players in the current age, so helping to ensure playing a 4-drop on the fourth turn is always worth considering. Transformation is just gravy. There’s an awful lot of 2/3s for 3 in this set. I love being able to create tokens with it. However, I’m not sure I would bother melding it too often, althro I will always look closely into new finishers. So, just under half of Red cards do I find interesting in this set? Maybe that isn’t too bad, but nothing I am orgasmic about, and certainly nothing that will compel me back to the tourney scene. I’ve lost faith in WotC making sets I will go ga-ga over, but who knows…maybe Kaladesh will surprise me. This entry was posted in Magic: the Gathering and tagged Set Review.